Reading Tocqueville then and now: Alexis de Tocqueville, pictured at right (Library of Congress Prints and Photographs Division [LC-USZC4-4563 DLC]), wrote Democracy in America for his compatriots. They had just gone through the Revolution of 1830 in which they once again overthrew the Bourbon Dynasty, which had been forcibly restored by the Congress of Vienna following the defeat of Napoleon in 1814-15. The 1830 revolution did not lead to a second republic, however. Instead Louis Philippe, the so-called Citizen King, came to power. Tocqueville, correctly as events would prove, saw the Revolution of 1830 as a continuation of the "Great Revolution" of 1789. He assumed that France — and other European states — would sooner or later abolish their monarchies entirely. Democracy, he believed, was the wave of the future. Hence his intense interest in the United States. Democracy had proceeded furthest there. France would someday resemble the United States. "Here is our future" was his overriding theme. Democracy in America excited a good deal of discussion in France but far more in the English-speaking world. Tocqueville's first translator into English was John Stuart Mill, perhaps the most influential British thinker of the day. His interest was in Tocqueville's analysis of the dynamics of democratic societies. Tocqueville was no simple advocate of democracy. It posed a key dilemma for nineteenth century liberals like him and Mill. Liberal political theory, as classically formulated by John Locke at the end of the seventeenth century, held both that government rested upon the consent of the governed and that government existed to protect property rights. If consent meant something like universal manhood suffrage, the definition that Americans upheld, then the large unpropertied majority could vote themselves unlimited shares of the property of others. This was the precise issue raised by the Chartists in Britain. Their petition campaigns coincided with Mill's translation of Democracy. It was also the issue facing France. Suffrage there was restricted to large property-holders. Tocqueville came to believe that the limiting of political power to the privileged would prove impossible. In late 1847 he warned of yet another revolution. In February of 1848 it came. The upheavals of 1789, 1830, and 1848 were all one revolution, he later wrote, and one that was not yet finished. The Paris Commune of 1871, something he foresaw but did not live to see, proved him again prescient. Yet he shared with Mill a fear of universal suffrage. It would destroy property rights. Americans read Democracy, in the Mill translation, with very different issues in mind. They, by and large, had come to believe that mass participation in politics and the sanctity of property were not incompatible. As a result, they focused on a number of other aspects of the book. One was the flattering notion that their nation was in the vanguard. Americans in the 1830s and 1840s were only too aware that Europeans tended to regard them as a sort of cultural backwater. To have a discussion of their political system move to the center of European thinking was very gratifying. Americans also relished the praise Tocqueville lavished upon certain aspects of their society. His chapter on "How Americans Understand the Equality of the Sexes" provides an example. He explained the notion of "separate spheres," i.e., that men and women had different but complementary roles, in the context of American ideas of freedom and equality. Furthermore, he wrote that, were anyone to ask him to explain the success of the American experiment, he would answer "the superiority of their women." Tocqueville also praised the separation of church and state, again in terms that particularly gratified Americans. Religion, he found, was at the center of much of American culture. And it was the purely voluntary commitments Americans made to particular churches that explained, for him, their success in attracting and retaining members. We read Democracy with still other questions in mind. We tend to focus upon his discussion of the impact of slavery on the development of the South and of the North, and especially his concern that the South might well break up the Union. We heed his analysis of racial prejudice and its likely persistence even after the abolition of slavery. We focus on his warnings of the "tyranny of the majority." We tend, that is, to concentrate upon those parts of Democracy that best seem to explain American history in the decades immediately following Tocqueville's visit. His explanation of sectional rivalries and suspicions strikes us as prophetic. The states that increase less rapidly than the others look upon those that are more favored by fortune with envy and suspicion. Hence arise the deep-seated uneasiness and ill-defined agitation which are observable in the South and which form so striking a contrast to the confidence and prosperity which are common to other parts of the Union. I am inclined to think that the hostile attitude taken by the South recently [in the Nullification Crisis] is attributable to no other cause. The inhabitants of the Southern states are, of all the Americans, those who are most interested in the maintenance of the Union; they would assuredly suffer most from being left to themselves; and yet they are the only ones who threaten to break the tie of confederation. It is easy to perceive that the South, which has given four Presidents to the Union, which perceives that it is losing its federal influence and that the number of its representatives in Congress is diminishing from year to year, while those of the Northern and Western states are increasing, the South, which is peopled with ardent and irascible men, is becoming more and more irritated and alarmed. Its inhabitants reflect upon their present position and remember their past influence, with the melancholy uneasiness of men who suspect oppression. If they discover a law of the Union that is not unequivocally favorable to their interests, they protest against it as an abuse of force; and if their ardent remonstrances are not listened to, they threaten to quit an association that loads them with burdens while it deprives them of the profits. "The Tariff," said the inhabitants of Carolina in 1832, "enriches the North and ruins the South; for, if this were not the case, to what can we attribute the continually increasing power and wealth of the North, with its inclement skies and arid soil; while the South, which may be styled the garden of America, is rapidly declining."
. . . It must not be imagined, however, that the states that lose their preponderance also lose their population or their riches; no stop is put to their prosperity, and they even go on to increase more rapidly than any kingdom in Europe. But they believe themselves to be impoverished because their wealth does not augment as rapidly as that of their neighbors; and they think that their power is lost because they suddenly come in contact with a power greater than their own. Thus they are more hurt in their feelings and their passions than in their interests. But this is amply sufficient to endanger the maintenance of the Union. If kings and peoples had only had their true interests in view ever since the beginning of the world, war would scarcely be known among mankind. It is prophecy grounded in an implicit critique of John Locke and classical liberalism. Men form civil societies, Locke held, out of the perception of their rational self interests. That is, they surrendered a portion of their liberty to the government in return for a measure of security. Tocqueville emphatically disagreed. What keeps a great number of citizens under the same government is much less a reasoned desire to remain united than the instinctive and, in a sense, involuntary accord which springs from like feelings and similar opinions. I would never admit that men form a society simply by recognizing the same leader and obeying the same laws; only when certain men consider a great many questions from the same point of view and have the same opinions on a great many subjects and when the same events give rise to like thoughts and impressions is there a society. White Southerners had the most to lose if the Union were to break up. That would not prevent them from seeking to accomplish exactly that, Tocqueville warned. We read Democracy, as a result, as a corrective to our own Lockean understanding of government and society. I remember that while I was traveling through the forests which still cover the state of Alabama, I arrived one day at the log house of a pioneer. I did not wish to penetrate into the dwelling of the American, but retired to rest myself for a while on the margin of a spring, which was not far off, in the woods. While I was in this place (which was in the neighborhood of the Creek territory), an Indian woman appeared, followed by a Negress, and holding by the hand a little white girl of five or six years, whom I took to be the daughter of the pioneer. A sort of barbarous luxury set off the costume of the Indian; rings of metal were hanging from her nostrils and ears, her hair, which was adorned with glass beads, fell loosely upon her shoulders; and I saw that she was not married, for she still wore that necklace of shells which the bride always deposits on the nuptial couch. The Negress was clad in squalid European garments. All three came and seated themselves upon the banks of the spring; and the young Indian, taking the child in her arms, lavished upon her such fond caresses as mothers give, while the Negress endeavored, by various little artifices, to attract the attention of the young Creole. The child displayed in her slightest gestures a consciousness of superiority that formed a strange contrast with her infantine weakness; as if she received the attentions of her companions with a sort of condescension. The Negress was seated on the ground before her mistress, watching her smallest desires and apparently divided between an almost maternal affection for the child and servile fear; while the savage, in the midst of her tenderness, displayed an air of freedom and pride which was almost ferocious. I had approached the group and was contemplating them in silence, but my curiosity was probably displeasing to the Indian woman, for she suddenly rose, pushed the child roughly from her, and, giving me an angry look, plunged into the thicket. In the same place I had often chanced to see individuals together who belonged to the three races that people North America. I had perceived from many different traits the preponderance of the whites. But in the picture that I have just been describing there was something peculiarly touching; a bond of affection here united the oppressors with the oppressed, and the effort of Nature to bring them together rendered still more striking the immense distance placed between them by prejudice and the laws. What I have been most anxious to establish is simply this: Many people in France imagine that a change of opinion is going on in the United States which is favorable to a centralization of power in the hands of the President and the Congress. I hold that a contrary tendency may distinctly be observed. So far is the Federal government, as it grows old, from acquiring strength and from threatening the sovereignty of the states that I maintain it to be growing weaker and the sovereignty of the Union alone to be in danger. Such are the facts that the present time discloses. The future conceals the final result of this tendency and the events which may check, retard, or accelerate the changes I have described; I do not pretend to be able to remove the veil that hides them. Tocqueville in this chapter focused upon two principal dangers. One was the uneven pace of development, North and South. Both were growing rapidly but the North far more so. This led Southerners to suspect that the North was using its increasing power in the Union against their region. He saw the Nullification Crisis as an ominous example. The other danger came from the popular antipathy to a strong central government embodied by Andrew Jackson and the Democratic party. Here too Tocqueville saw the crisis over South Carolina's claim to be able to nullify the tariff as a sign of things to come. He highlighted not simply the role of John C. Calhoun but the influence of his ideas as clear threats to the Union. One can focus upon each danger in turn. a) The Pace of Change — Thomas Jefferson had believed that it would take a thousand years to populate the territory acquired by the Louisiana Purchase. It was not an unreasonable calculation. Americans had taken two centuries to spread from the Atlantic to the Alleghanies. But it would take only two generations for them to settle the entire Mississippi Valley. Such growth was, Tocqueville observed, unprecedented in human history. 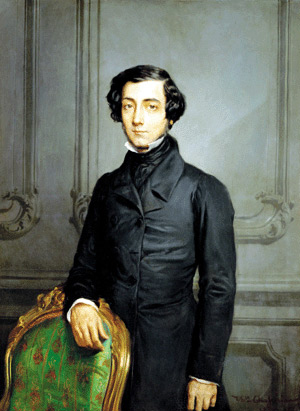 Why, according to Tocqueville, was such rapid growth hazardous? How, in his view, did it worsen sectional tensions? b) States' Rights — Tocqueville thought that Democratic politicians were committed to weakening the federal government and strengthening the states, even when this meant destroying valuable institutions or ignoring the clear language of the constitution. He gives several examples. One is the battle over the Bank of the United States. In this Jackson destroyed a national economic institution. Another was Jackson's support for Georgia's and Tennessee's claims that their state laws superceded treaty provisions between the United States and the Cherokee. A third was the Nullification Crisis, in which Jackson asserted federal powers but did not exercise them. How did Tocqueville explain the rise in States' Rights sentiments following the War of 1812? How did Tocqueville portray Jackson? What can we make of Tocqueville's comment that: "The power of General Jackson perpetually increases, but that of the President declines; in his hands the Federal government is strong, but it will pass enfeebled into the hands of his successor."